–The life of an Essentialist is a life lived without regret. If you have correctly identified what really matters, if you invest your time and energy in it, then it is difficult to regret the choices you make. You become proud of the life you have chosen to live. 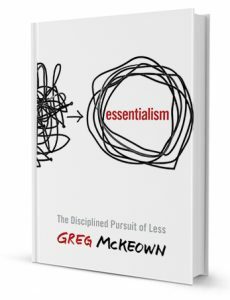 That paragraph from page 237, near the end of the book, is the essence of Greg McKeown’s book, Essentialism. The author lays out philosophy of Essentialism that stress the importance on the phrase, “Less is better.” In a distracting world with a myriad of options and choices, we have lost the ability for effective decision-making. Also, we have embraced the myth of having it all as the best way to live. Essentialism divides into four sections: Essence, Explore, Eliminate, and Execute. Each section covers an aspect of the esssentialist philosophy and how we can incorporate into our everyday lives. McKeown stresses throughout the book that essentialism must be lived out and we include our loved ones in this undertaking to be successful in becoming an essentialist. McKeown covers topics from the how to say no gracefully, setting boundaries, celebrating small wins, the importance play and sleep, and understanding that you will have a trade-off as you become more of an essentialist. All of these topics and several others are vital as one embraces this belief system. I read this book in a two days after I listened to the author on the Art of Charm Podcast discussing it. His interview and reading the book resonated me with quite profoundly. I declare that Essentialism will be the most important book I have read in 2016. I will give it my highest recommendation and it will at least make you think about how to do and live life in a different way.